Almay Waterproof Gentle Eye Makeup Remover – $6.90, Wal-Mart – Maybe I’m an odd ball, but I always start my night time routine by removing my eye makeup. I change up what I use frequently, but find that I am always returning to this remover from Almay. It doesn’t sting my eyes and it works really well at removing waterproof mascara. Olay Foaming Face Wash, Sensitive – $3.99, Wal-Mart – Next up, I like to wash my face with this facial soap after I’ve rinsed off the cleansing oil. It just ensures that all the makeup and oil is washed off my face. And it’s super gentle, too, as the name implies! Acne Medication – I didn’t include pictures of this, because they’re prescribed by my doctor. But this is the time I’ll apply the medication that helps keep my acne under control. Neutrogena Hydro Boost Water, Gel – $12.65, Wal-Mart – I mentioned this product in last weeks post, but I’ve been loving using this water gel to moisturize my face. While I have oily skin, I don’t find that this clogs my pores or makes my skin more oily. It leaves my skin feeling very plump and soft, which is exactly what I’m going for in a moisturizer! Softlips Cube 5-in-1 Lip Care – $2.97, Wal-Mart – This is my favorite lip balm! It smells and tastes amazing and I find that I’m always applying some to my lips whenever I go into my bathroom. 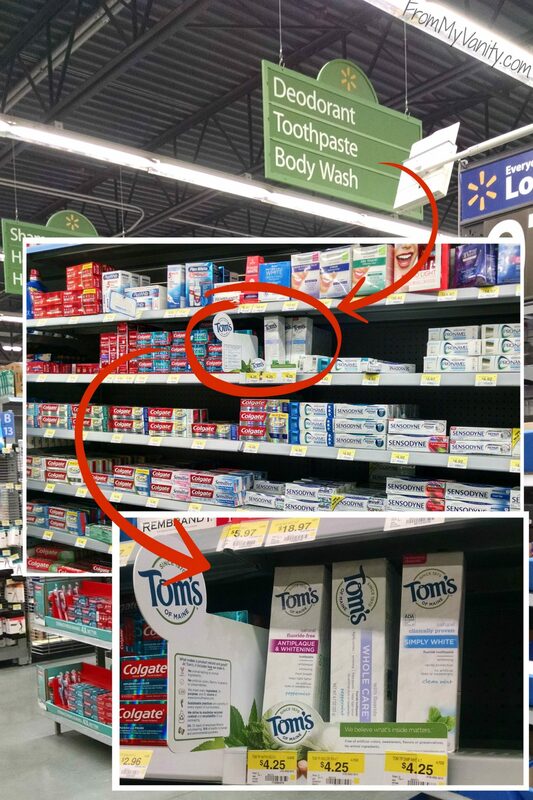 Tom’s of Maine® Simply White® Clean Mint Cavity Protection Toothpaste – $4.25, Wal-Mart – Lastly, I finish off by cleaning my pearly whites! 😉 Recently I’ve gone back to using this toothpaste from the Tom’s of Maine® line. I used to use them all the time before I got married — it was the toothpaste my Mom would buy. And I’m glad I’m back to using them! They don’t taste any different or ‘weird’ for being natural and better for you, and you can find them right on your local Wal-Mart shelves, too, so it’s convent and you can get it for less! See? Such a cute little fur ball, right?! 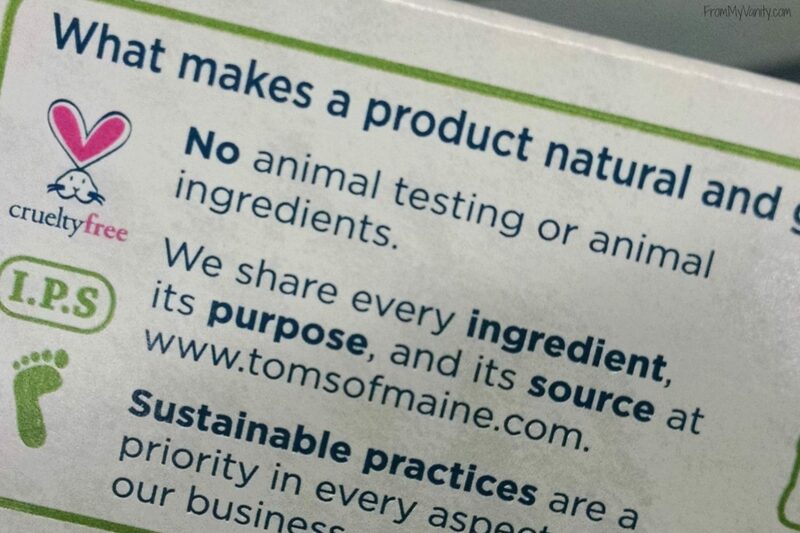 If you want to learn more about the Tom’s of Maine® brand and what they stand for, be sure to check out their website, www.exploretomsofmaine.com! 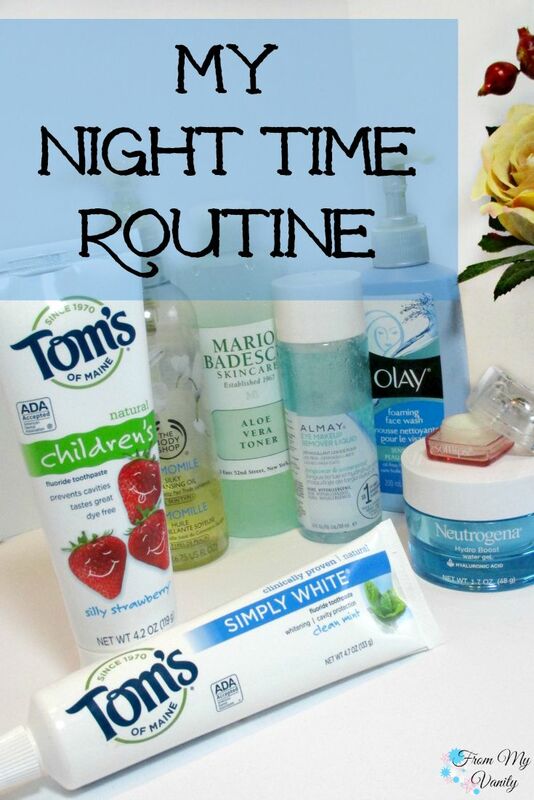 In the meantime, I’d love to hear what toothpaste or makeup remover is a must-have for your night time routine! I’ve been loving it! I am getting low, and want to just repurchase the same thing (why stop a good thing, right?!) but the beauty blogger in me says I should probably try something else and see if it’s comparable, lol. I’ve tried the Chamomile cleansing Balm, But not the oil! I’ll have to add that one to my list because I really like the balm a lot! I’ve been meaning to get into cleansing oils. Right now I’m all about micellar waters. Dr. Jart+ is my fave! I’m not really picky when it comes to toothpaste. Just good ol’ Crest works for me (especially when it’s on sale)! That little lippie cube looks so cute! I have never tried Toms, but I love what the company stands for! I’m all about natural products! I LOVE the soft lips cubes — I own way too many 😛 but I put them everywhere: purse, bathroom, vanity. They smell so amazing! OMG literally everything in this post I need! 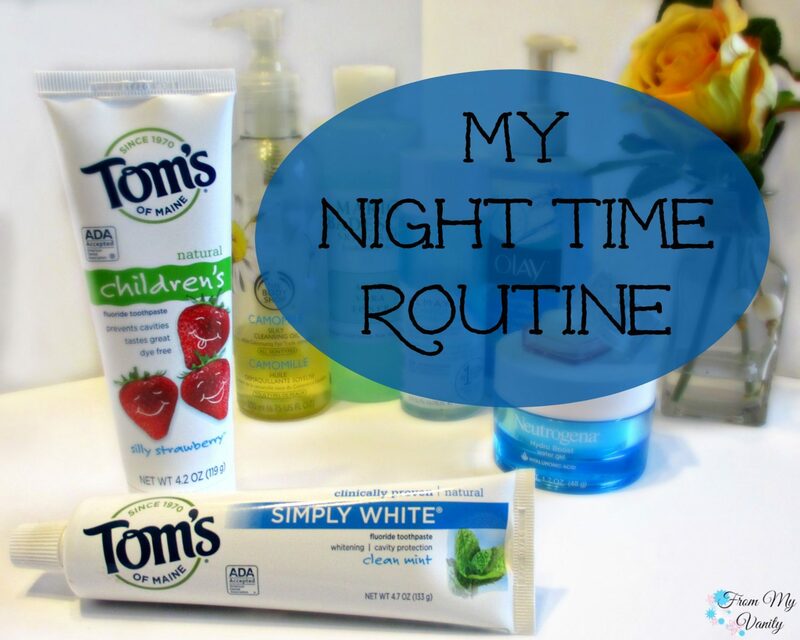 I love my TOMs toothpaste for sure and right now I am addicted to Neutrogena Hydro Boost moisturizer! It smells sooooooooo good!!! Great nighttime ritual! I love seeing what people use in their routines as well! What acne medication are you using? The Softlips cube has been on my want-to-try list for a while lol. I’m actually using a prescription from my doctor that is safe to use while pregnant — one is erythromycin and the other is azelaic acid cream. Ohh, if you’re going to get a Softlips cube, look for the holiday limited edition Hello Kitty ones. I hear they’re starting to pop up and they have fun flavors! It does smell really nice! What a nice looking routine! I like using natural body care products too. Like Christine, I also have the Body Shop cleansing balm and I love it! I love cleansing oils (I use Julep’s). I haven’t tried the Body shop version yet, but it sounds quite nice so next time I’m there I may just grab it. I need to go toward more natural and organic as well. I take off my eye makeup first too, so I don’t think you’re weird. I like the products that you use. I’ve tried Tom’s deodorant but not the toothpaste. I might pick some up when I run out of my current tube. Thanks for sharing your routine. I always find it interesting to see what other people use. I’ve been wanting to try The Body Shop Cleansing Oil, once I finish my current one I think I’ll try it. I love the Camomile Cleansing Oil, I really need to get a new bottle – my last one lasted about six months I think! The BS Camomille Cleansing Oil is my holy grail makeup remover!! I’d love to try the Mario Badescu toner, they have such amazing skincare! Yes, they are! Thanks Jiawun! 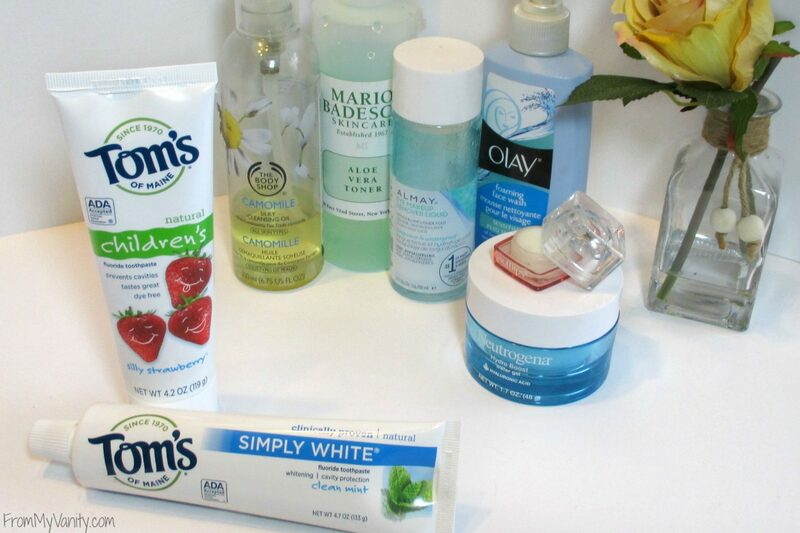 I loved reading about your routine and you’ve got me all intrigued about that Neutrogena gel. Haven’t seen it here though.